Warner Brothers Interactive hosted a panel at San Diego Comic-Con, 'LEGO DC Super-Villains: Meet the Talent Behind the Video Game', that brought together some of game's developers and voice talent, as well as a LEGO designer, Justin Ramsden, all the way from the company's headquarters in Denmark. If you're wondering what a LEGO designer has to do with a videogame, the answer is more than you think. 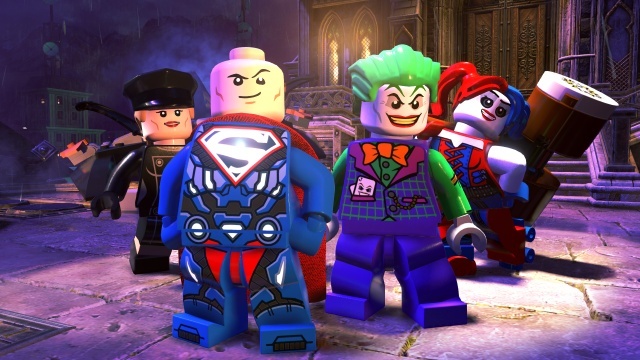 LEGO DC Super-Villains includes an extensive character creator that will let gamers really customize the look and powers of the villain that will serve as their character throughout the game, and LEGO worked closely with the game's developer, Traveller's Tales (TT), to make sure that all of the character parts looked right for LEGO parts. Also, care has been taken that every level in the game can be built using LEGO bricks that you can buy from the store. The panel was moderated by Andrea Rene, while Arthur Parsons, head of game design at TT, and Ames Kirshen from DC took the lead on most of the discussion. The voice talent included some big names in the voice acting world. Kevin Conroy, who not only voices Batman in LEGO DC Super-Villains, but also provided his voice in the Arkham game series, Batman: The Animated Series, and many other shows. The voice of Harley Quinn is provided by Tara Strong, who has an extensive resume that also includes voicing Teen Titan's Raven and My Little Pony's Twilight Sparkle. Fred Tatsciore lends his deep baritone voice to Solomon Grundy and Killer Croc, characters he has voiced before in animation, and who has appeared in numerous video games, most recently Destiny 2, Middle-Earth: Shadow of War, and Call of Duty: WWII. Lastly, Julie Nathanson, the voice of Silver Banshee in the game, as well as Jess Black in Far Cry 5 and Chill in the Skylanders games, rounded out the voice talent half of the panel. One of the joys of watching a panel that includes voice talent is that they often drop into character when answering questions ' it's amazing to watch these talented people effortlessly change their voices into one that belongs to a character that you're so familiar with. Earlier in the day before the panel, Warner Brothers Interactive held a press roundtable with the panelists at an offsite location. I've incorporated some of what I learned there here, so think of this article as 'panel plus' coverage. 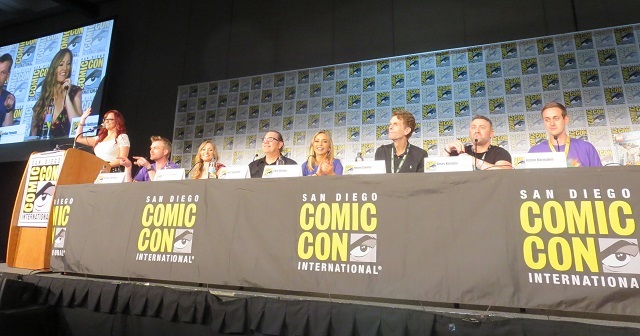 The panel opened with a discussion about the inspiration for LEGO DC Super-Villains. As the developers began designing their next DC LEGO game, they felt that they wanted to do more than simply make LEGO Batman 4. Instead they looked to the first LEGO Batman game's villain levels for inspiration and decided to try and build a game around the DC Universe's extensive villain lineup. They also wanted to try something new for a LEGO game and that led to the idea of letting the player create their own character that would be the star of the story. The character creator has always been a feature of LEGO games, but it's always been tucked away to the side, more of an extra feature than a core component of the game. They wanted to bring it front and center and make it an integral part of the game experience so that you can now be the star of the story and become a new member of the Legion of Doom. The new character customizer is far more powerful than anything that's appeared in a LEGO game before. Basically every part that can go on a minifig can be individually selected and customized, and there are also a large number of accessories that you can add to your new villain, like a toy car that sits around your waist, fairy wings for your back, or a hot dog outfit. The new customizer gives you options beyond your look, letting you customize your powers as well. If you want to have a beam attack, you can choose the beam's style and color, and whether it emanates from your eyes or hands, for example. When crafting the story for the game, the developers looked to Forever Evil for inspiration, but wanted to put a new spin on the story. In Forever Evil, the Justice League members disappear in a flash of light just as the Crime Syndicate from the parallel universe of Earth-3 appears. The Crime Syndicate is basically the evil versions of Earth's Justice League heroes and they immediately go to work spreading chaos as soon as they arrive. Standing in their way are the super-villains of the Legion of Doom who, led by Lex Luthor, decide that they don't want to cede the Earth to the Crime Syndicate and therefore become its unlikely defenders. Since this is a LEGO game, humor plays a big role in this variant of the Forever Evil story and this makes the approach taken by the voice actors to their characters a bit different than if they were voicing them in a more serious game or show. The actors didn't look to do parodies of their characters, but rather tapped into the humorous side of their personalities. They said that it helped them to draw upon their experience working together as actors on other projects and the way that they goof around together between takes. This helped them to tap into the playful side of their characters, as they gleefully demonstrated throughout the panel. Another thing that helped them to get into LEGO character was to think of how their characters would approach making a joke, even in a more serious situation, and use that same approach while delivering the jokes in the game. This was made more challenging in the making of LEGO DC Super-Villains because the nature of the way games are made meant that the actors had to read and record their lines individually, without the benefit of acting through entire scenes together or seeing the game scenes in which the lines would be delivered. LEGO DC Super-Villains is all about the villains (plus a few heroes), and TT dug through the entire DC universe to fill out the game's roster of over 150 villains. They wanted to be sure that female characters were well-represented in the game as well. The panel began introducing some of the previously unannounced villains with a series of short gameplay videos that featured Silver Banshee, Black Adam, Lobo, and Darkseid. Next came a series of screenshot reveals that featured Mister Mxyzptlk, Polka Dot Man, Clock King, Toyman, Mr. Freeze, and The Ventriloquist. At that point the panel was having so much fun that they began to reveal additional characters by shouting them out ' I caught Livewire, Killer Frost, Catwoman, Cheetah, and even Condiment Man. TT also took advantage of the panel to reveal the game's hub world. The developers' goal in LEGO DC Super-Villains was to give you as much of the DC universe as they could for you to explore. Through a series of screens shown in the meeting room one area of the huge hub world after another was revealed. Some locations were not too surprising ' Ace Chemicals, the Batcave, Arkham Asylum, Strykers Island, etc. ' but other areas include places that wouldn't immediately come to mind such as Joker's Amusement Mile, the Gotham Botanical Gardens, The Watch Tower, and, for the first time in a video game, the town of Smallville. And there will be a lot to do in each of these locations, you can even go to the theater in Smallville and watch a show. It's good to see that the people behind the game have so much enthusiasm for it and had so much fun making it because all of that will certainly find its way into the game and make it that much more enjoyable to play. Watch for LEGO DC Super-Villains on PC, PS4, Switch, and Xbox One on October 16th.